Coming to the Miller household on a Sunday is risky! If someones favorite team is losing you just never know what kind of insults are going be flying around! The thing is my hubby makes some pretty amazing game day food and people seem to think the food is worth putting up with his poor loser temper! He makes wings, hotdog wraps, chili, bbq and this pretty awesome buffalo chicken dip. He gets all kinds of chips, soda and even goes as far as to set it all up! And he doesn't just do this for the people that come over, he dresses up my dog too!! Now dear readers I am a Colts fan! 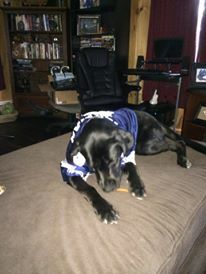 So you can imagine just how mad I get every Sunday when I come home from Church to find my baby wearing a Dallas jersey! Loki seems happy though to be part of the fun so I let it go! Sadly though for Loki table food is a very rare thing for him. So he doesn't get to enjoy my hubby's cooking, that is okay though because thanks to Pup-Peroni's treats he can tailgate with all his human friends!